So, on a night when I should be in class (er, in the kitchen), I played hooky. As much as I love going to school and sweating it out in a kitchen over hot stovetops, ovens and getting grimy cleaning things in a 3 compartment sink, I told my instructor that I won't be going to our culinary kitchen lab this week. What could possibly keep me from going?... 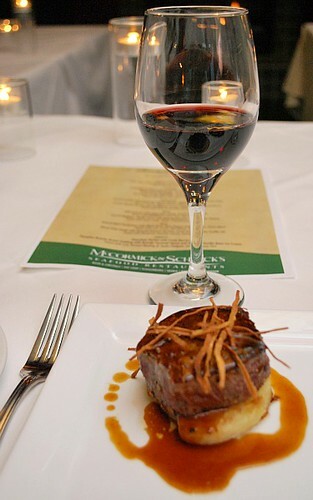 An amazing dinner at McCormick & Schmick's, featuring "An Evening of Perfect Combinations." Normally, I'm not a fan of chain restaurants, however I do have some exceptions (Olive Garden, anyone?). Well, aside from my guilty pleasure of Olive Garden, I've added McCormick & Schmick's to the list of chain restaurant likes. 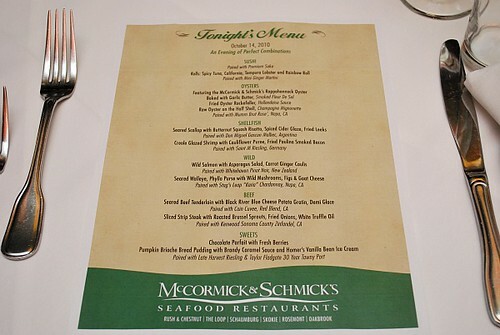 McCormick & Schmick's is a seafood restaurant chain but should also be noted for their steaks as well. I've been to McCormick & Schmick's years ago but I can't honestly say the restaurant left an impression where my previous visit was memorable... until now. I was recently invited by a public relations representative of McCormick & Schmick's to dine with them for a special wine paired dinner prepared by several area McCormick & Schmick's chefs. Accompanying me was my mother in law, so we could enjoy some time together. Little did I know what deliciousness awaited us! The variety of sushi was delicious where we had our fill of Spicy Tuna Maki, California Maki, Tempura Lobster Maki and a Rainbow Roll. 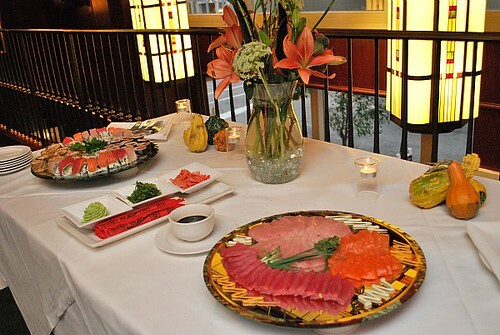 For sashimi, there was salmon, ahi tuna and hamachi. My personal favorite from the rolls was the Lobster Maki. The crispy and warm exterior was a great contrast to the cool and soft middle. Then again, it was lobster and who could not like a little lobster? 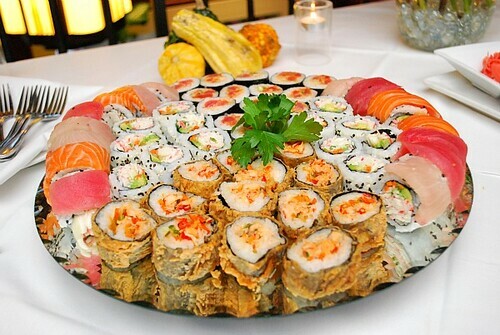 As for the sashimi, each one was delicate, clean, fresh and just melted on the tongue. 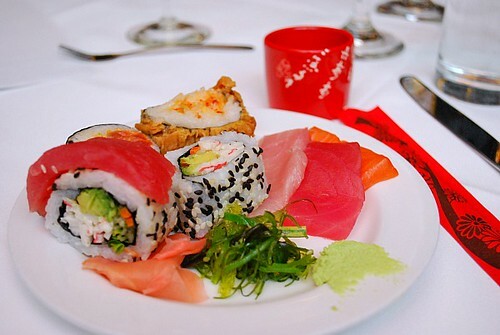 Who knew McCormick & Schmick's could dish out some pretty good sushi?! All of the sushi paired exceptionally well with the Ginger Martini and the premium sake we were also offered. 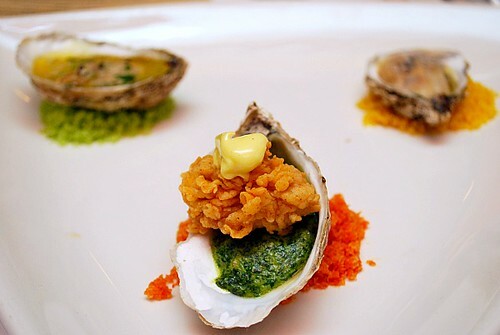 Beautifully arranged, we were all presented with a lovely plating of oysters, done in three ways: Baked with Garlic Butter over smoked Fleur de Sel (left), Fried Oyster Rockefeller with Hollandaise Sauce (middle), and Raw Oyster on a Half Shell with a Champagne Mignonette (right). Each oyster was delicious, nicely prepared and extremely great flavor given the different preparations. My favorite was the simply done, Raw Oyster on a Half Shell. It was clean, fresh and done very well with the Champagne Mignonette. My second favorite was the Fried Oyster Rockefeller. The crispy, breaded oyster had a nice contrast to the creamed spinach the shell was stuffed with. My least favorite, although very delicious, was the Baked Oyster with Garlic Butter. It didn't have a 'wow' factor for me but overall, this course was a great way to kick off the evening meal. With these oysters, we paired them with a Mumm Brut Rose from Napa, California. 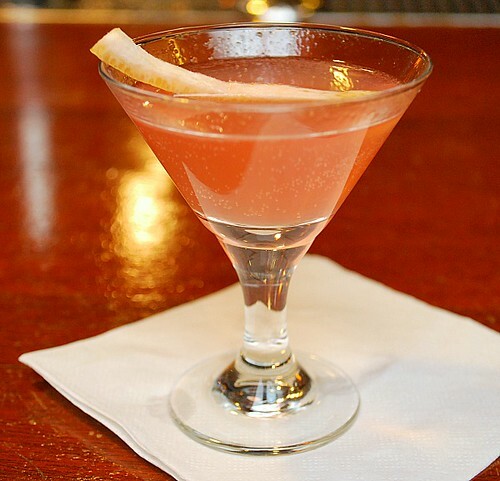 It has a lovely, pale pink salmon hue with notes of black cherry, raspberry and strawberry. Our next course was dedicated to shellfish. 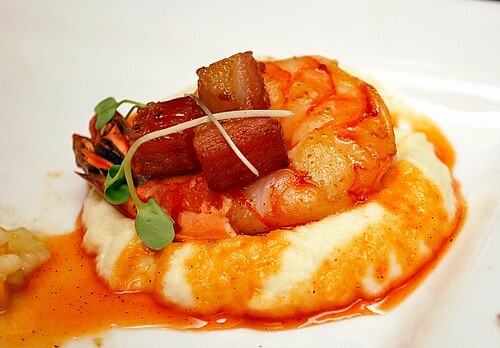 We enjoyed a Creole Glazed Shrimp with Cauliflower Puree and Fried Paulina Smoked Bacon. Before we get to the shrimp, can I just say how I have a new fondness for cauliflower? The cauliflower puree was so smooth and flavorful that it could have easily passed as mashed potatoes or even mashed turnips. It served as a nice backdrop to the shrimp loaded with flavor and the juicy cubes of bacon just put it over the top for me. Bacon of any kind on any dish will easily have my vote! Paired with the Creole Glazed Shrimp was a sweet and clean Saint M. Riesling from Germany. It had hints of lemon which complimented the shrimp nicely. 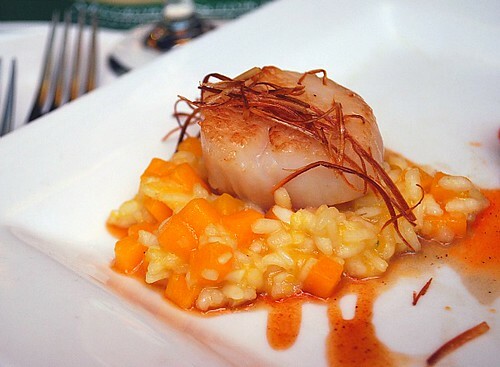 Also part of the shellfish course was this Seared Scallop with Butternut Squash Risotto, Spiced Cider Glaze and garnished with Fried Leeks. It seems like a mouth full to say, but oh, was it a mouth full of deliciousness. The scallop was cooked to perfection. It wasn't overdone, just as many places will do, and with the butternut squash risotto, it was a great touch of fall. The butternut squash was cut into precise French brunoise (diced 1 to 2 mm on each side) and the fried leeks was a nice garnish that offered some texture. 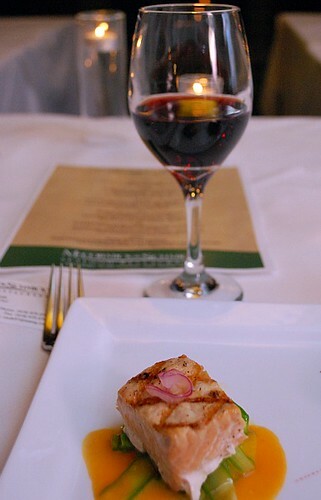 To wash this scallop dish down, a Don Miguel Gascon Malbec from Argentina was paired with it. Don Miguel Gascón Malbec is a full bodied wine with a deep violet color, showcasing flavors and aromas of blackberry, blueberry, plum, dark cherry, and a hint of mocha. The wine is elegant and rich in texture, with soft, round tannins and a long velvety finish. By this time in the dinner, my mother in law and I were starting to feel our pant waists getting a bit snug. But we ate on. How could we resist the next course of wild fish?! For this course, we were presented with a Seared Walleye with a Phyllo Purse stuffed with Wild Mushrooms, Figs and Goat Cheese. My mother in law raved about the Phyllo Purse, even well after the dinner. In fact, I attempted to make this at home the next day, which I'll be posting and sharing soon. 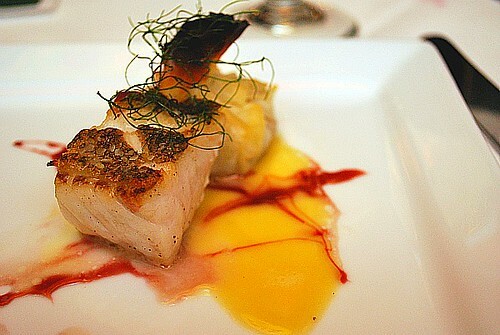 But getting back to the dinner, this was probably one of the best walleye dishes I've had in a long time. The chef that prepared this course explained that it was simply seasoned, pan seared and finished in the oven. With the Phyllo Purse, it was such a great combination. 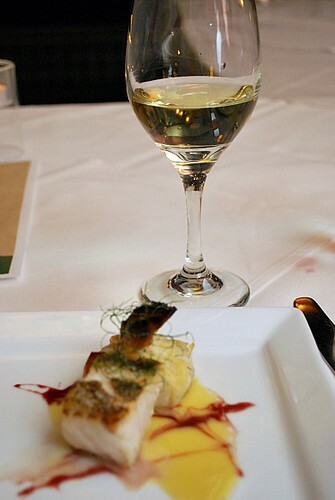 With the walleye, we had a Stag's leap "Karia" Chardonnay from Napa, California. Karia, which means graceful in Greek. This wine has much more aging to do. However, at its current state, it has a lot of tropical fruit notes with a bit of roundness and fullness that went well with the walleye. 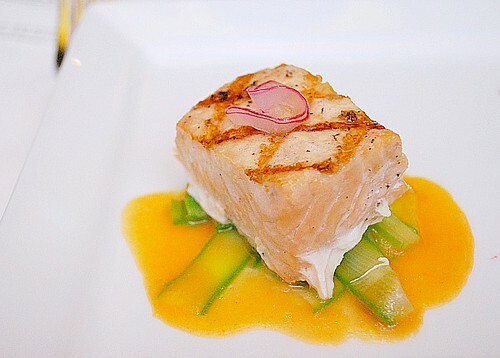 The other wild fish we enjoyed during this course was Wild Salmon atop an Asparagus Salad and Carrot Ginger Coulis. I appreciated the different way this dish served up asparagus, which was shaved lengthwise into ribbons. The coulis was not only colorful but had a nice flavor that went well with the salmon.Overall, it was a beautifully presented dish that tasted fresh and clean. The salmon was paired with a Whitehaven Pinot Noir from New Zealand. This wine had a rich ruby color that matched the flavors of dark cherry and plum. I also tasted some oakiness with a subtle spice, which was a interesting paired with the salmon. Although, I thought it would have been better with a more stronger dish because it slightly overpowered the salmon. So we're at our fifth course for the evening and it's like the last stretch of a gastronomic marathon for us. After all the amazing seafood courses, I knew I couldn't pass up the beef course. 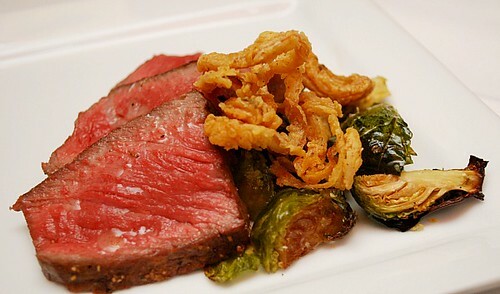 Here, we had Sliced Strip Steak with Roasted Brussel Sprouts, Fried Onions and White Truffle Oil. This was excellent. I loved how the strip steak was prepared. It was so tender and melt in your mouth amazing. The brussel sprouts were done very well and it even inspired me to make some soon! The fried onions were nice but wasn't necessary. For a seafood restaurant, they certainly do steaks very well too. The strip steak was served with a Kenwood Sonoma County Zinfandel from California. I definitely tasted some jammy fruit in this wine - raspberry maybe? There was also some spicy notes which made it an excellent wine to pair with the strip steak. The second part of our beef course was a Seared Beef Tenderloin with Black River Blue Cheese Potato Gratin and Demi Glace. I'm a big fan of blue cheese so I knew I'd love the potato gratin. It was a great base for the beef to sit upon and a wonderful way to include blue cheese into the dish. 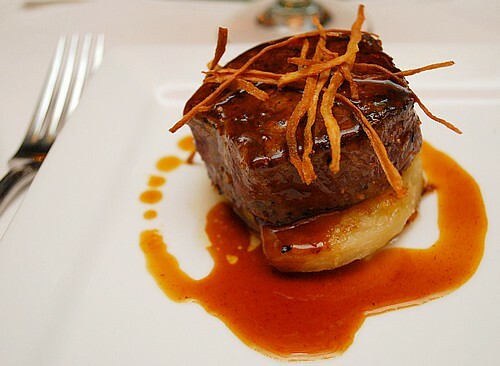 The beef itself was amazingly melt in your mouth and cooked once again, to perfection. 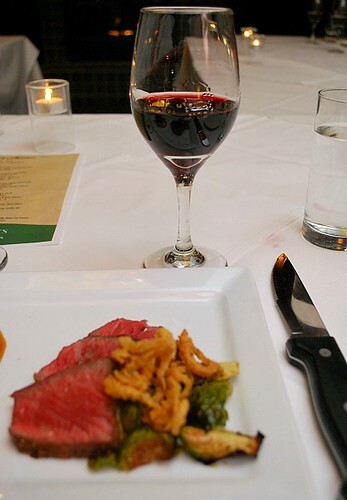 To pair with the tenderloin, a Cain Cuvee from Red Blend, California was served. This wine has a blend of two cabernets and merlot grapes that I really enjoyed. It was rich, velvety smooth and paired wonderfully with the beef. And then there was the dessert course. 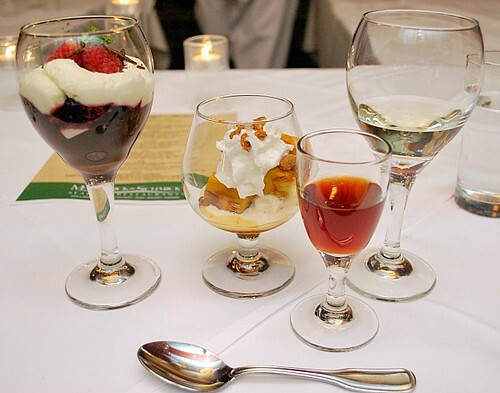 It was an impressive presentation where all parts of this course were served in glasses. From left to right, we enjoyed a Chocolate Parfait with Fresh Blackberries and Raspberries, a seasonal Pumpkin Brioche Bread Pudding with Brandy Caramel Sauce and Homer's Vanilla Bean Ice Cream and these desserts were paired with a Taylor Fladgate 30 year Tawny Port and a Late Harvest Riesling. It was an amazing ending to an even more amazing meal. I loved the combination of fresh berries in the parfait and with chocolate in the mix, you really can't go wrong. The bread pudding was autumn in a glass. The pumpkin and brandy caramel was ridiculously good, especially with the ice cream. I really didn't drink too much of the Riesling and port but did manage a few sips of each just for the pairing. They went well with the desserts however at this point, I preferred my nice cup of coffee with the end the meal. 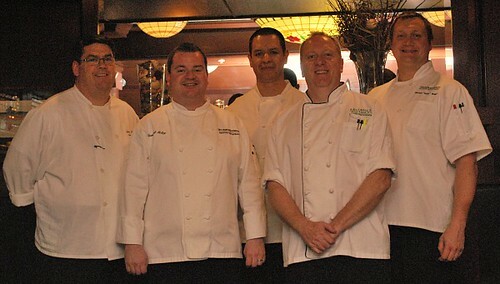 From Left: (1) John McGowan, Executive Chef, M&S Skokie; (2) Domhnall Molloy, Senior Executive Chef, M&S Chicago; (3) Carlos Farias, Executive Chef, M&S Chicago Wacker Drive in the Loop; (4) Dan Smith, Executive Chef, M&S Milwaukie, WI (at Wauwatosa Mall); (5) Mike "Wally" Wallach, Executive Chef, M&S Chicago Rush & Chestnut location. The wonderful meal we enjoyed were made with care by these above chefs. My hats off to each of them for a job well done. Being in culinary school, I certainly have a greater appreciation for what these chefs do in the kitchen and I know what kind of time and effort went into each plate we were served. After our dinner, we had a chance to meet and talk with the chefs. I will say that speaking with each of them was probably the highlight of the evening for me. It was great to talk about their inspiration for the courses they prepared, their own personal journey in their career as a chef and getting some advice from them about being in the food service/culinary art industry. These chefs reconfirmed my passion for cooking and being in the industry and I left inspired with their stories. In fact, I plan on getting some on the job experience with one of the chefs in the future by observing their service on a weekend and perhaps jumping in where I may be needed to help. My thanks go out to the staff of McCormick & Schmick's for all their work to put together a successful dinner and memorable experience for us. We will most definitely be back and will think of McCormick & Schmick's as a great restaurant to go to for seafood and steak. 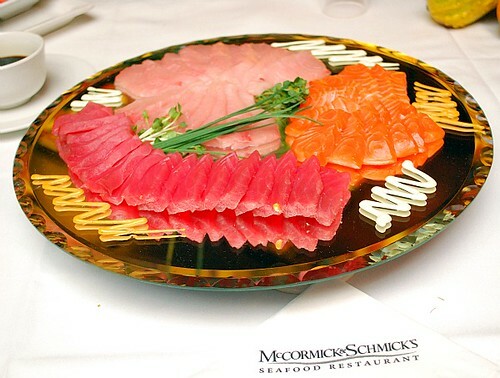 If you have a McCormick & Schmick's restaurant near you, I encourage you to check them out and be prepared for a wonderful meal and exceptional service.